Don’t go in there alone. Next post: Whitekeys is back! Quick, get the women and children off the streets! Don’t go in here alone. Did you make that?? It is beautiful. I enjoyed your post on the 4th and after being in Seldovia it really brought it to life. I did. And thanks, both of you! 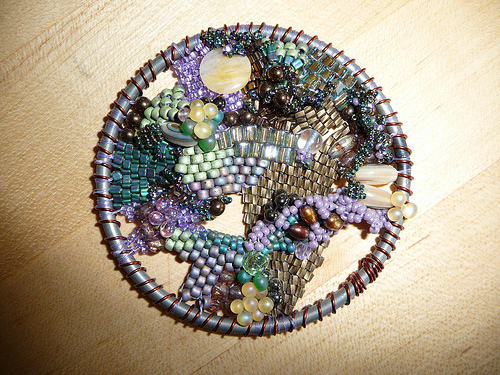 Not only are you a fantastic writer, your beadwork is amazing. I love this piece. Dana, could you put something next to your piece so we can get a sense of scale? A dime, a quarter, your hand?? It’s so beautiful. Thanks for sharing. That is so beautiful. I love the colors, and the way the beads are placed. I could look at that for hours. Thank you for sharing. Thanks, Kathryn. Sometimes it works. That is a beautiful piece. Well done. That is lovely, Dana. Have you ever been in Arizona when the Tucson Gem Show is on? Not only are the gems lovely and fascinating, there are lots of vendors for beads of all kinds. I went into on hotel lobby where they were selling beads and came out having spent around $100, and I don’t even do beadwork! I gave them to friends of mine who do and got about a dozen pairs of earrings out of the deal.